modern standards, it gets laughs even when done straight. Even the elements that go beyond the old silent movie serials and the 18th- and 19th-century music hall entertainments they were based on — such as Nell being in love with Dudley's horse — seem almost normal in the context. Dudley was first seen in in 1948, in The Comic Strips of Television, where he was test-marketed along with Crusader Rabbit. His first actual use in a series, however, came in 1961, when Rocky & His Friends switched networks to NBC and changed its name to The Bullwinkle Show. It was one of the back-up features, along with such holdovers from the original series as Peabody's Improbable History and Fractured Fairy Tales. It proved the most popular of the lot — and the only one to later get a show of its own. Its 39 four-and-a-half-minute episodes were rerun in 1969-70 as the lead feature of ABC's The Dudley Do-Right Show. Or at least, 38 of them were. One episode, "Stokey the Bear", about a bear hypnotized into starting, rather than preventing, forest fires, was pulled from the series after one airing. The U.S. Forestry Service objected to what it saw as degradation of its mascot, Smokey Bear. 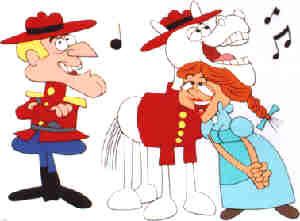 Dudley Do-Right was originally the creation of co-producer Bill Scott, who also provided the character's voice; but producer Jay Ward also had a hand in development. Other voices include Paul Frees (Boris Badenov, Ludwig von Drake) as Inspector Fenwick, June Foray (Rocky the Flying Squirrel and Tweety Bird's "Granny" over at Warner Bros.) as Fenwick's daughter Nell, and Hans Conried (Captain Hook in Walt Disney's Peter Pan) as the villain, Snidely Whiplash (who committed all the melodramatic atrocities, including tying Nell to railroad tracks, that were old when Desperate Desmond was committing them). Dudley appeared in the back pages of a few Rocky & Bullwinkle comics from Dell and Gold Key Comics in the 1960s, but only had a single brief series of his own — Charlton Comics published seven issues of Dudley Do-Right in 1970 and '71. Other than that, his only foray into other media is a forthcoming live-action movie, starring Brendan Fraser, who, in another adaptation of a Jay Ward cartoon, played George of the Jungle. Today, Dudley Do-Right lives on in two ways. First, there is (of course) the endless series of televised reruns. Second, for quite a few years, a small shop at 8200 Sunset Blvd., Los Angeles — the official outlet for all Jay Ward character merchandise — was called Dudley Do-Right's Emporium. Text ©2000-09 Donald D. Markstein. Art © Jay Ward Productions.